SUBIACO (KFSM)–In year number two for Steven Moore, the Trojan program is trending up. The Trojans won two of their first four games last fall but ended the year on a six game skid. 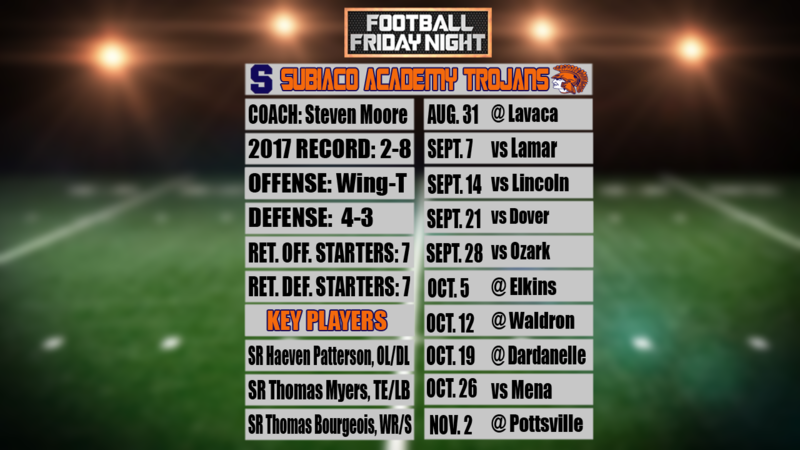 This season, Subiaco Academy has a unique schedule this fall that features four consecutive home games between weeks two and five, followed by a three game road trip. "I don't mind it honestly," Bourgeois said. "I like the home games but I don't like traveling very far." "This year our theme is work," said Hertlein. "That's what we try to live by, to do everything 100% all the time." Subiaco opens up play at Lavaca on August 31.